The Book of the Week is The Shadow of Alpha by prolific horror author Charles L. Grant, who passed away last week at the age of 64. 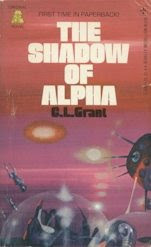 This is the first printing, paperback original of Grant's first book, published in 1976. The Shadow of Alpha is the first in a trilogy of post-apocalyptic science fiction novels. The series is best noted for conveying a strong sense of dread, and so few readers were surprised when Grant switched to horror after completing this series. Grant developed a large following as a horror writer, noted for frightening his readers with suspense rather than gore. He occasionally returned to science fiction with light-hearted SF comedies under the name Lionel Fenn (one of several C.L. Grant pseudonyms), with such great titles as Kent Montana and the Really Ugly Thing from Mars and 668: The Neighbor of the Beast. In addition to his own fiction, Charles L. Grant was a successful editor, notably editing the Shadows series of original anthologies, which showcased some of the most talented fantasists and horror authors in the world. By his own count, Grant wrote 78 books and edited 24 anthologies. He won two Nebula Awards and three World Fantasy Awards, was named a Living Legend by the International Horror Guild, and also received the Horror Writers Association' s Lifetime Achievement Award. He will be greatly missed by readers and by the entire field of fantastic literature. 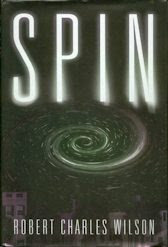 The Book of the Week is Spin by Robert Charles Wilson, winner of this year's Hugo Award for Best Novel. In Spin, the stars go out one day, after a mysterious intelligence places a barrier around Earth. Scientists later discover that time is passing dramatically faster within the barrier than outside, so much so that the sun will expire in about 40 years of our time. Spin is the 12th novel by Wilson, a Canadian author whose work has consistently been well-received, even by The New York Times Book Review. Wilson has been nominated for the Best Novel Hugo four times, but Spin is his first to win. Hard-core science fiction fans were pleased to see the Hugo Award go to a serious SF novel; four of the previous five winners were fantasies. On the other hand, Spin is accessible to readers who do not read much SF (in praising the book, Stephen King said it has "zero geek factor"). Congratulations to Robert Charles Wilson! A collector's note: This book is too recent in vintage to be terribly valuable, but the first edition of a Hugo-winning novel often appreciates tremendously over time. It can't hurt that Robert Charles Wilson signed this copy for me the day after he won the award, and drew a little picture of the Hugo Award in the book. “Inside Job” is an excellent example of Connie Willis's renowned wit and irony. The story follows Rob, a professional skeptic dedicated to debunking phony psychics and mystics, who encounters a medium channeling notorious skeptic H.L. Mencken. Each time she does this, Mencken's spirit promptly berates her audience for believing in such nonsense. "Inside Job" first appeared in the Magazine of the Week, and was later published as a stand-alone hardcover book by Subterranean Press. 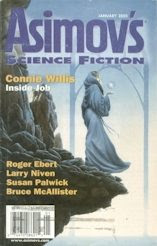 "Inside Job" was my #2 choice for best novella, behind only Kelly Link's remarkable story "Magic for Beginners," but I was still delighted that it won, because Connie Willis deserves all the accolades we can give her. She is a wonderful writer and an incredibly generous person. (You may recall from an earlier BOTW that she drove from Greeley to Denver just to meet with my son and his fourth- and fifth-grade classmates.) This is her ninth Hugo, the most Hugo Awards for fiction of any author ever. Congratulations to Connie Willis on this well-deserved recognition! Next week we will see the Hugo winner for Best Novel. The Magazine of the Week is the October/November 2005 issue of The Magazine of Fantasy & Science Fiction, cover art by Cory & Catska Ench. 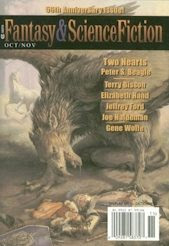 The cover story, "Two Hearts" by Peter S. Beagle, last week won the Hugo Award for Best Novelette of 2005. I was happy to see "Two Hearts" win the Hugo, even though it was my #2 choice in this category (oddly enough my #1 choice, "The Calorie Man" by Paolo Bacigalupi, also appears in the Magazine of the Week), because it is an honor for which Peter S. Beagle was long overdue. Peter Beagle has been an outstanding contributor to the fantasy field for nearly 50 years. He is perhaps best known as the author of the classic novel The Last Unicorn (1968), to which "Two Hearts" is something of a sequel. A young girl desperate to save her village from a fierce griffin enlists the aid of characters from The Last Unicorn, including a king who is too proud to refuse her, but may be too weakened by age to be of much help. Incidentally, the Hugo Awards for fiction are presented in four categories: novel, novella, novelette, and short story. A novelette is longer than a short story but not as long as a novel, while a novella is even a bit longer but still not quite as long as a novel. If you find this confusing, you might like the suggestion of James Patrick Kelly, this year's presenter of the Best Novelette Hugo, who proposed that the Hugos go decimal and give awards for Best Novel, Decinovel, Centinovel, and Millinovel. Next week's Magazine of the Week will contain this year's winner for Best Decinovel, er, Novella.